Towards the end of 2012, with discussion with my wife, I decided to take a day trip somewhere. Primary considerations were to visit somewhere new, and cost. 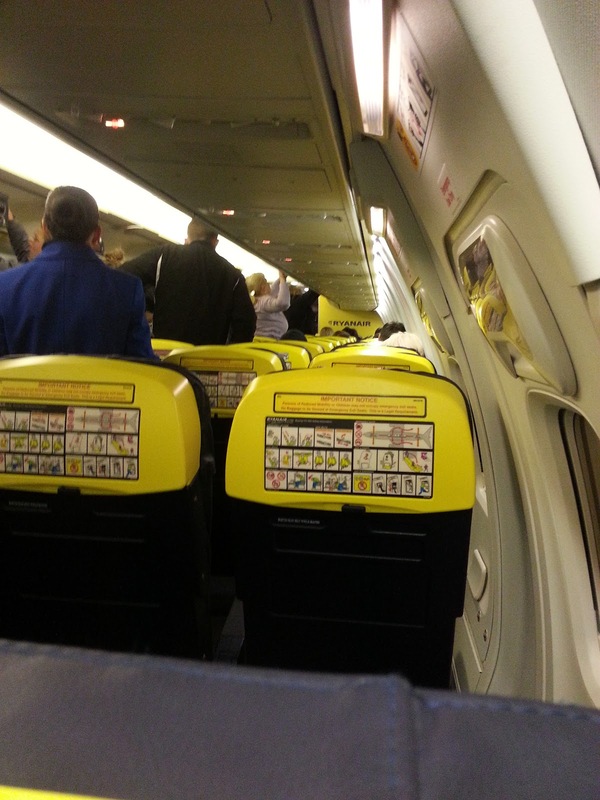 This precluded all full-service carriers, flying in Business etc, so naturally I turned to Ryanair. 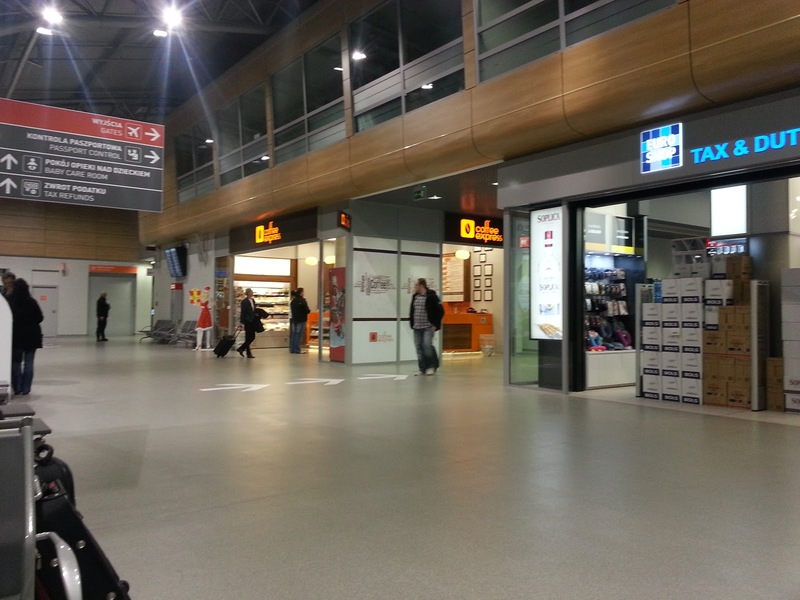 Thanks to the newly opened Warsaw Modlin airport, with nice incentives to passengers, I bought a return ticket for £11.54. Buying 2x oneways was cheaper, as I had a prepaid Mastercard with about EUR7 of credit on it, so I bought a oneway outward ticket for £4 plus £6 credit card fee, and the return was PLN8 (£1.54), no fee as I could use the aforementioned card. Overall, I spent a total of £55 on the day, including a day's parking in the mid-stay at Stansted, and petrol to and from Norwich, local transport in Warsaw and lunch. The flight was at 06:45, which meant a 03:00 departure from home - I was in the car 10 minutes after my alarm went off, fortunately not disturbing the children. The drive was easy, and I had a greasy McDo breakfast at the branch just by the mid-stay car park entrance. The bus to the terminal was already waiting, and I headed off. 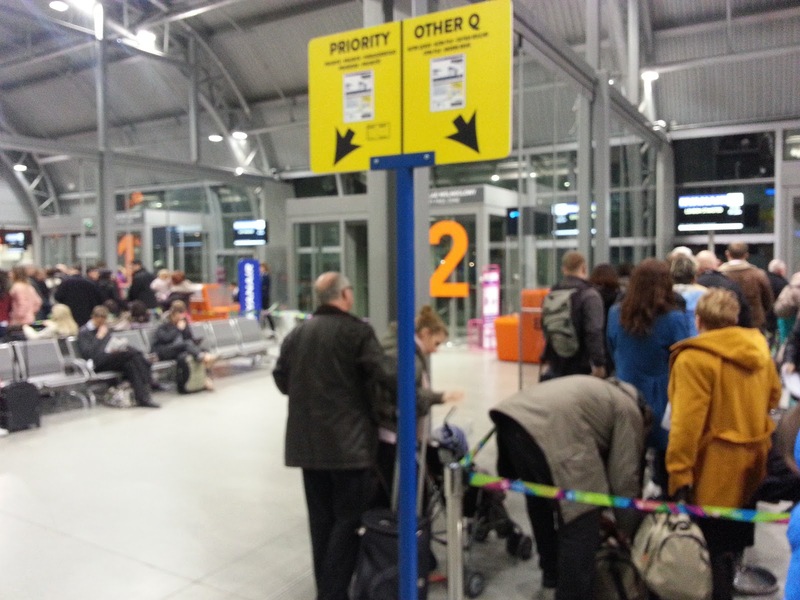 Security at the morning peak was busy as usual, and there was the usual "Wait in Lounge" on the FIDS. 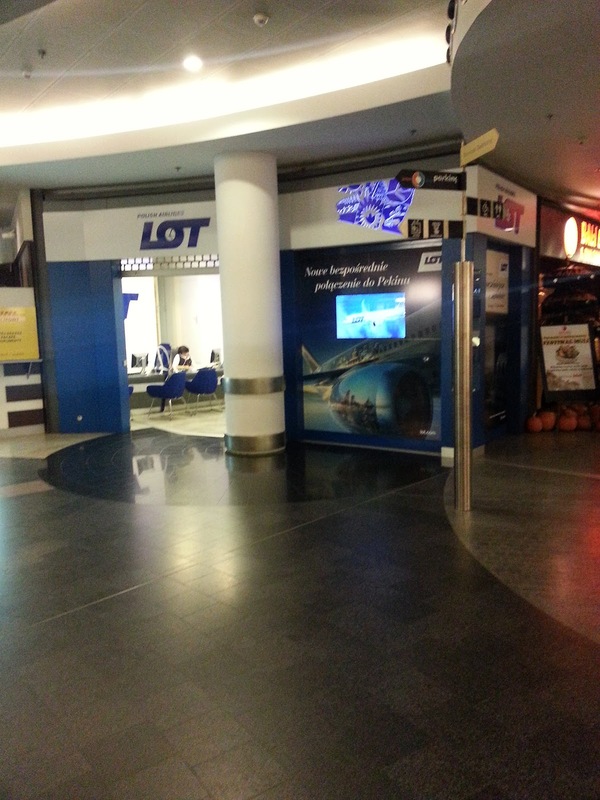 I took the gamble that the Modlin flight would leave from the usual Ryanair satellite, and walked over there. I then hung about hoping I was correct - as soon as the gate number appeared, I was in the regular queue, in 2nd place. 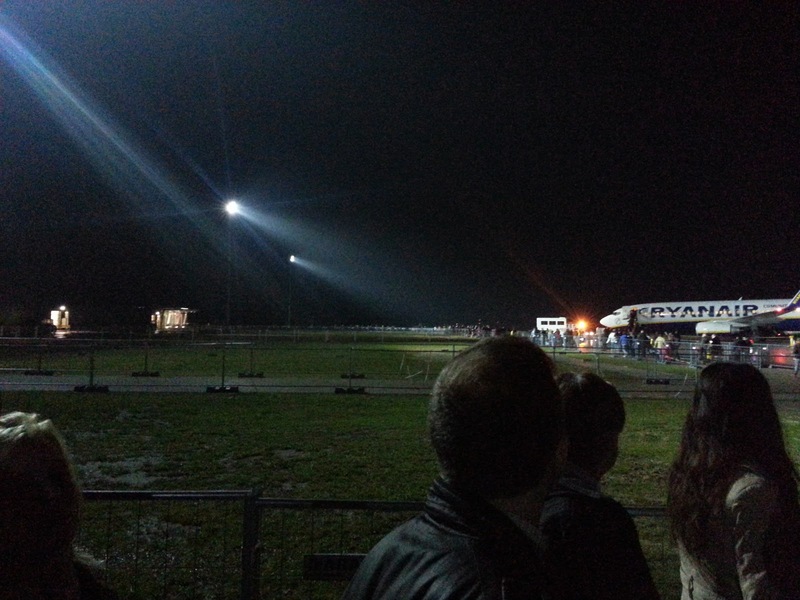 Eventually everyone took their seats, and we taxied out to the runway. By the time we reached almost the long-stay car park, we stopped and waited our turn. We continued waiting, until an announcement came over the tannoy. There was a problem with the air conditioning and we'd be returning to the gate for repairs. There was an audible groan. I wasn't too worried as I had plenty of time in Warsaw, unless there was a major delay, as my flight home that evening was at 21:25. 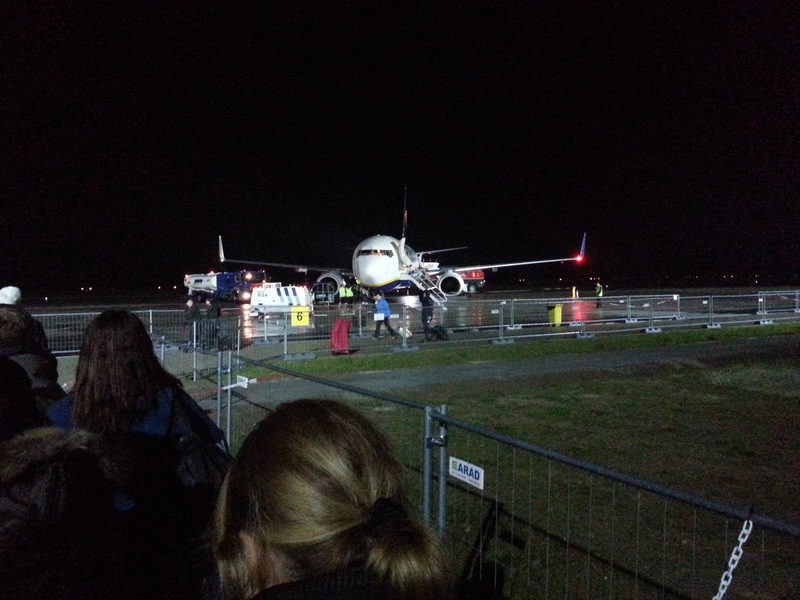 After about 30 minutes at the gate, we pushed back again - at least an aircraft change wasn't needed. And by this time it was light. I was still dozing, catching up on my missed sleep from the very early start. A long taxi later, and we took off into the gloom. It was a cloudy day so there wan't really much to see out of the window. 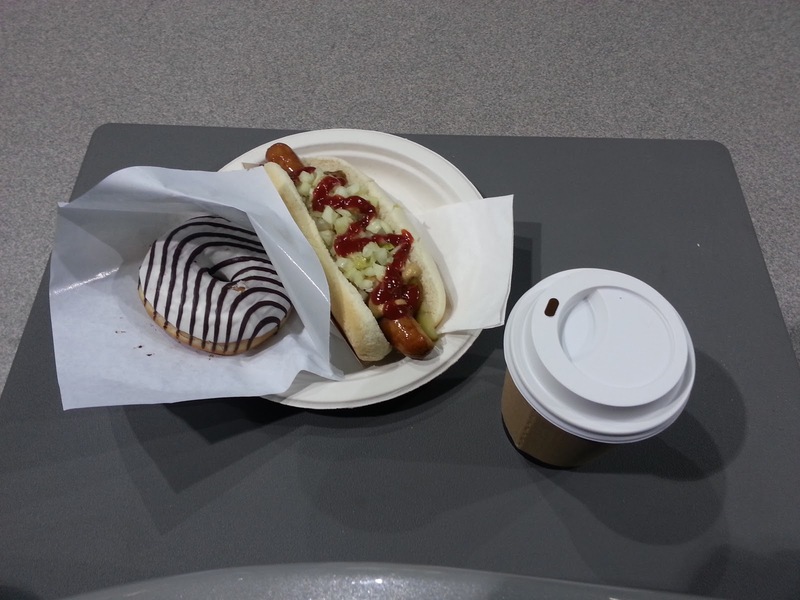 I continued dozing, so I didn't buy anything from the trolley (no muffins today, sorry Rasmus!) and before long we were descending through the clouds to land. Modlin airport is in a very rural location, with just some farm houses nearby, and the river Wisla. 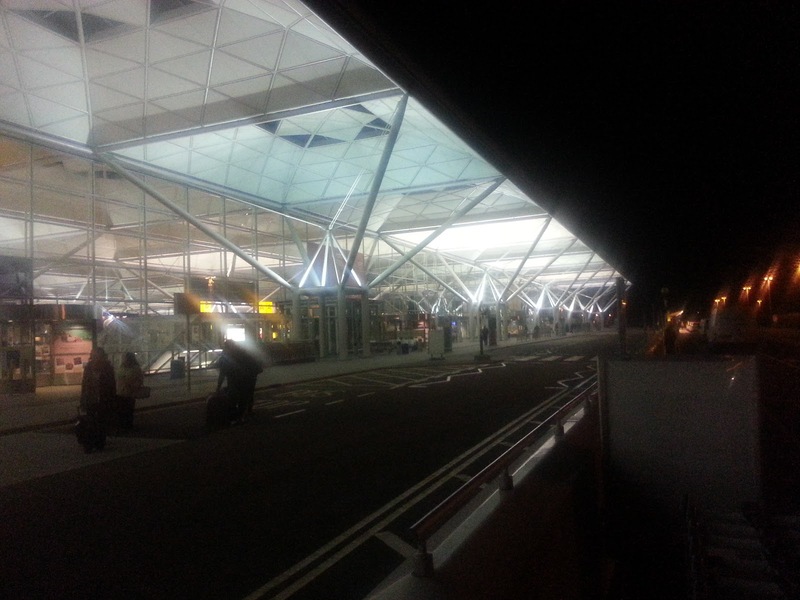 We soon touched down and taxied onto stand in front of the new terminal building. There is a large grassy area between the apron and the terminal, and there are paths that look temporary crossing this, with another for departing passengers to be held in an open-air "pen"-type enclosure. 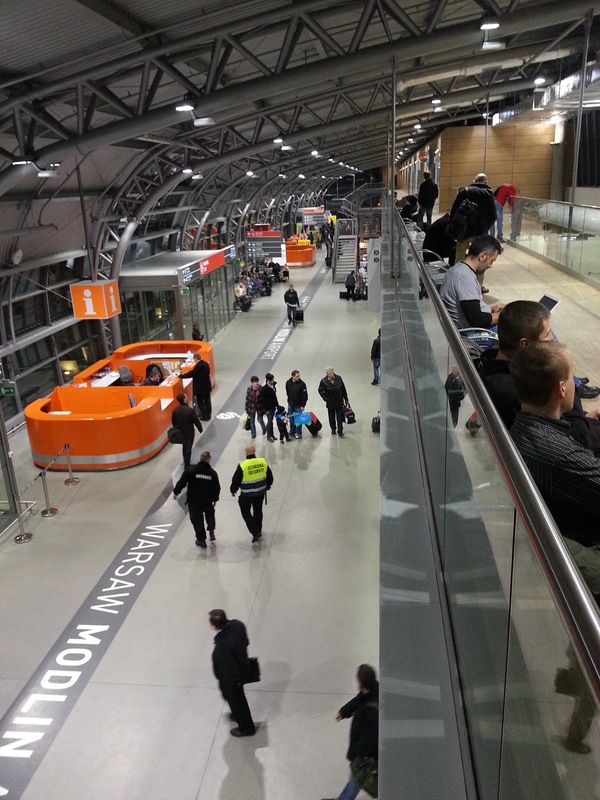 Getting from Modlin airport to the city is easy and cheap, if time consuming. There are direct busses to Centralna station, or the cheapest option (that I did) was a bus to the local Modlin town station, with a train continuing on to Centralna (or other suburban stations - not all go to Centralna, indeed I returned from Gdanska station). There was a kiosk in Arrivals selling tickets for this option. Eventually there is the hope to build a station at the airport itself, as there is an unused railway trackbed with most rails in situ, which would only need upgrading and electrifying. I soon arrived at Centralna station, where I bought a transport day pass, and had a look around (including the famous Palace of Science and Culture) before getting lunch. 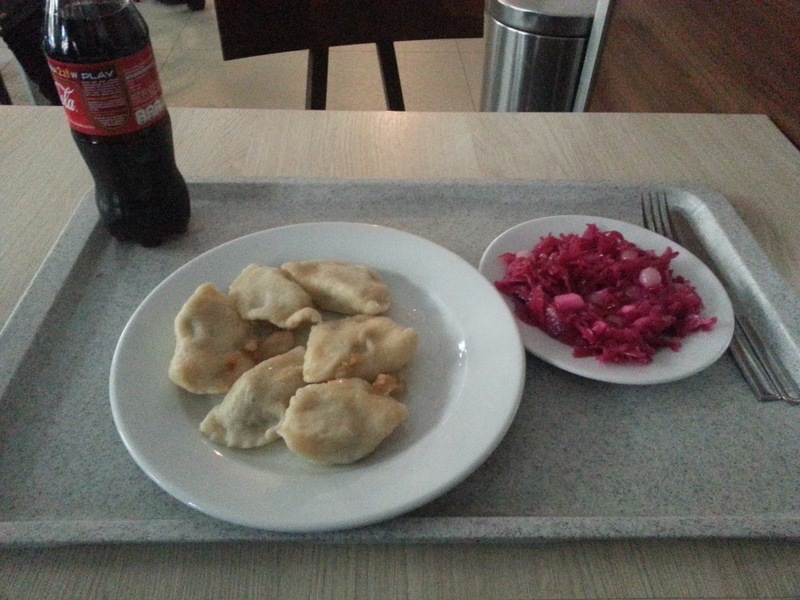 My meal - drink, bacon dumplings and a red cabbage salad, came to about £2.30. The ordering process was a bit convoluted. Just inside the door was a large board with the menu, just visible above, with a lady and a till where you ordered what you wanted. Or point to the fridge next to the serving hatch for cold drinks. Then you queue at the hatch, showing them your ticket to collect your food. 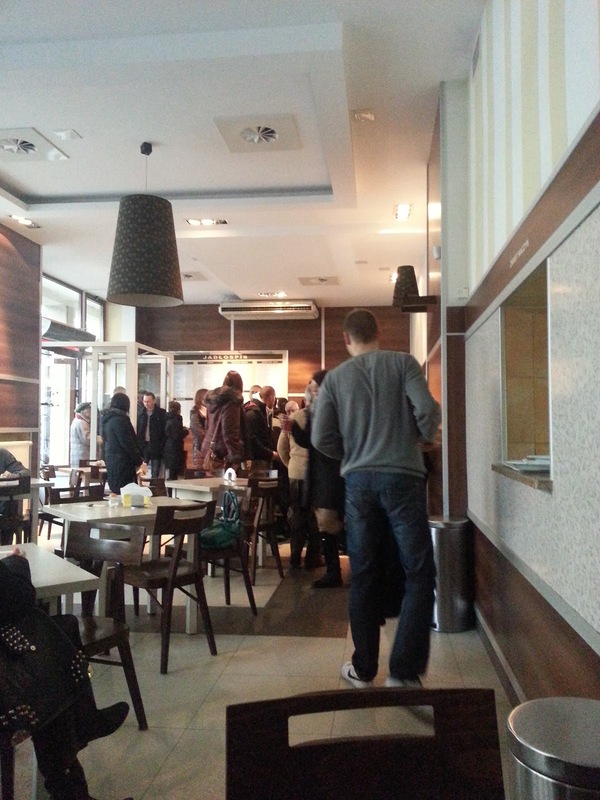 By the time I was eating, the queue went out the door, and the serving hatch queue did a couple of zigzags. 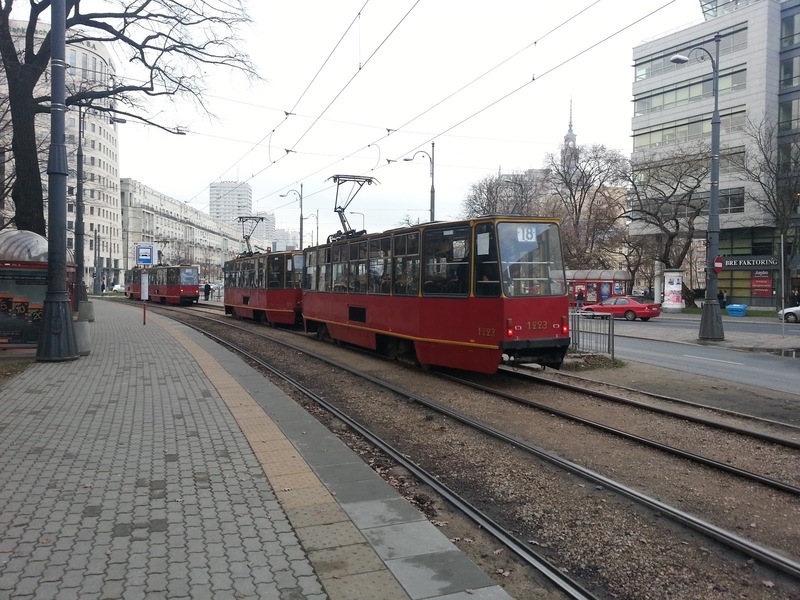 After eating, I went outside and took a tram towards the old town, which despite being completely flattened in WW2 was reconstructed in its entirety afterwards. One of the old style trams. They also had brand new modern ones, and everything in between. I got off near a park and walked towards the old town. Being the end of November, plenty of Christmas markets were being set up, but only the one in Old Town Square was open. I wandered around and bought a couple of presents, including a giant pencil for my son, and a wooden tortoise for my daughter. By now it was starting to get dark again. 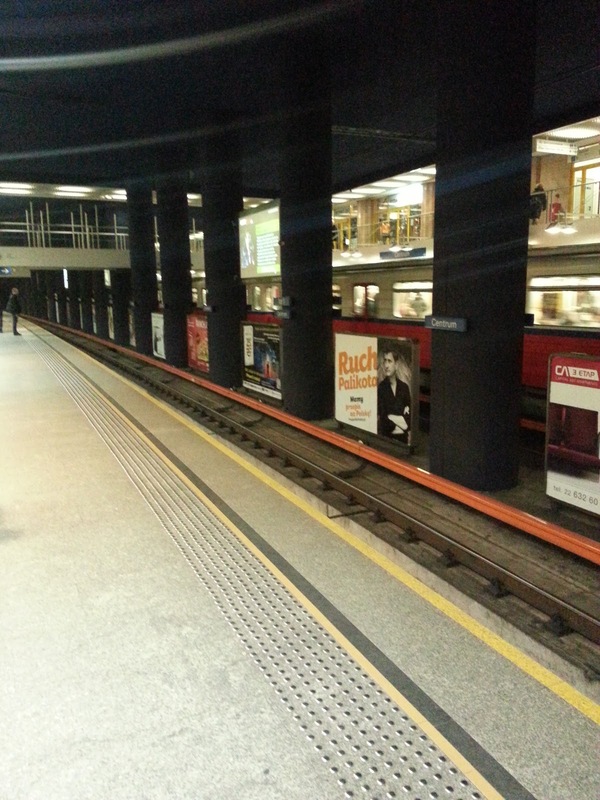 I then took the metro back to Centralna, for some more photos, and to try and find some cheap cigarettes for my manager, which I did from one of the many small shops that are underground in the metro entrances. 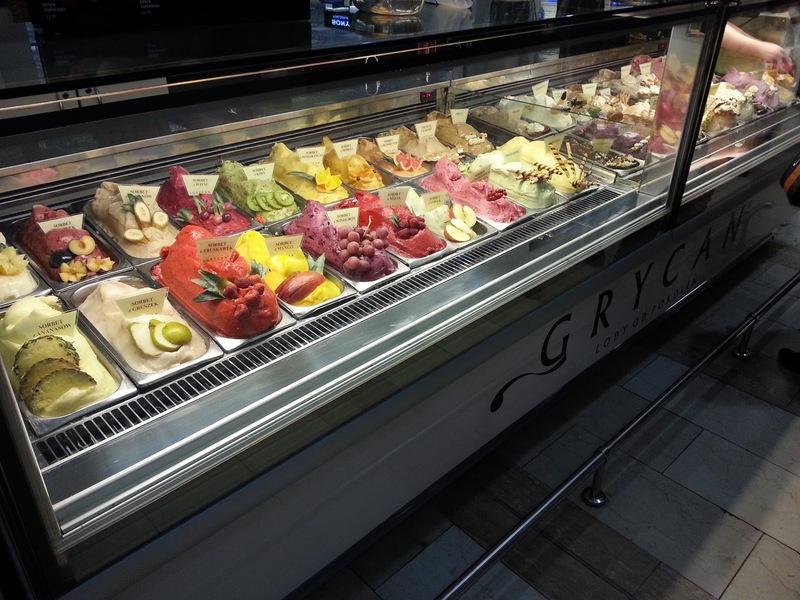 I had a look round a modern, very upmarket shopping centre by Centralna, without buying anything. 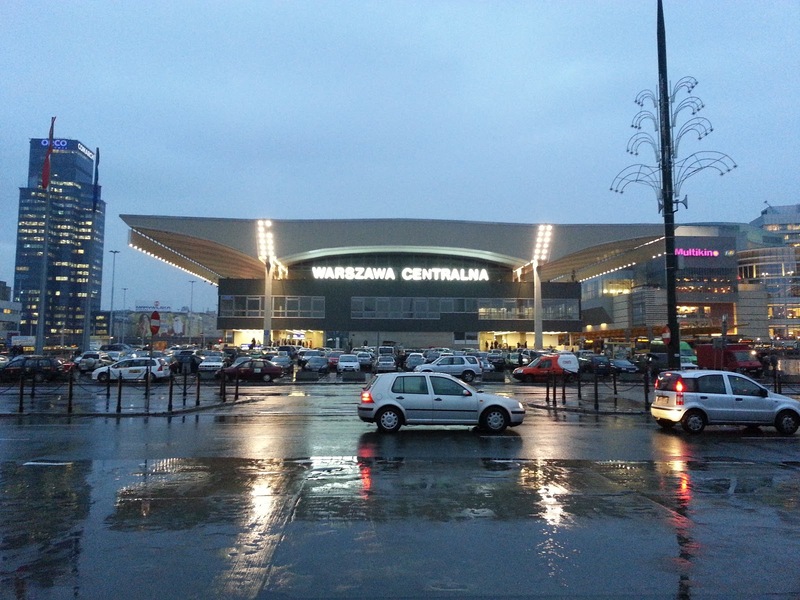 I then took the metro to Gdanska station, then a tram one stop along to the Arkadia shopping centre, apparently Poland's largest. I bought some chocolate and toothpaste from the Carrefour, and some gluten free goodies for my wife from a health food shop. 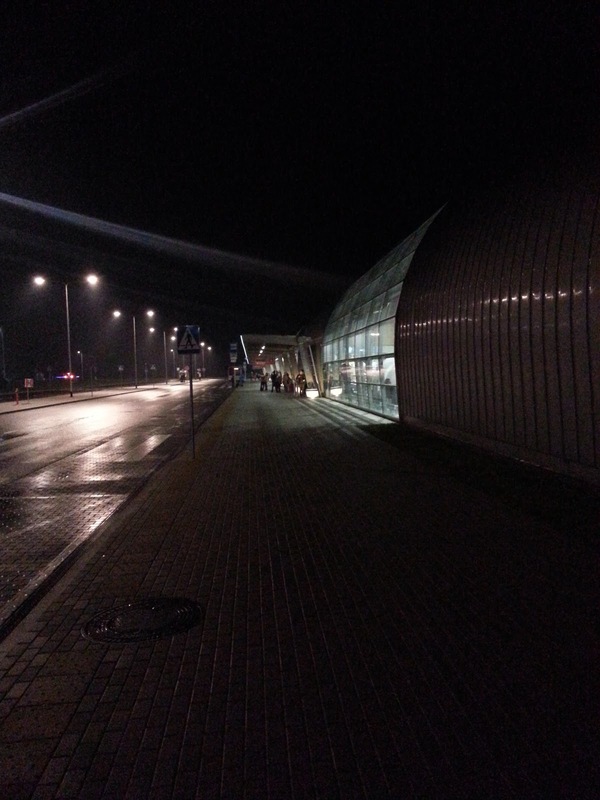 I then decided that it was getting late, and too dark to see much anyway, so I took the train and bus back to the airport. 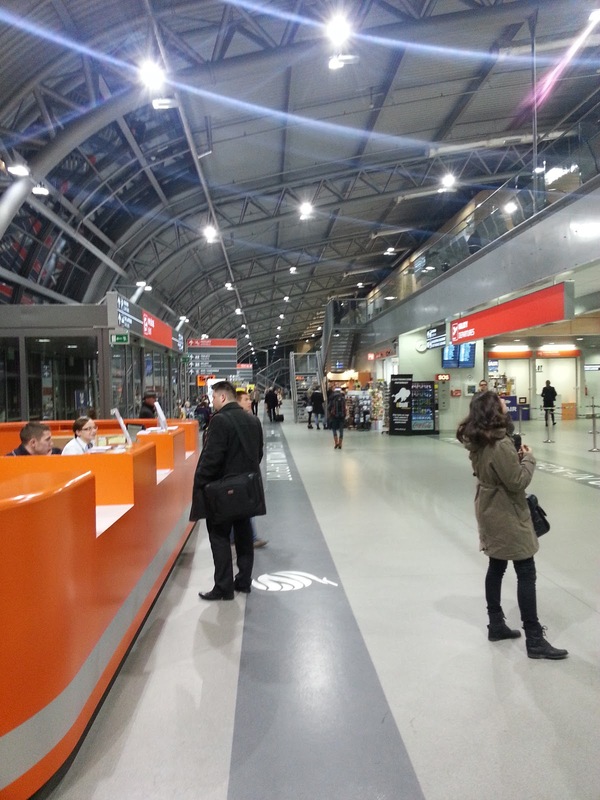 Note the ticket counters at Gdanska station are cash only. 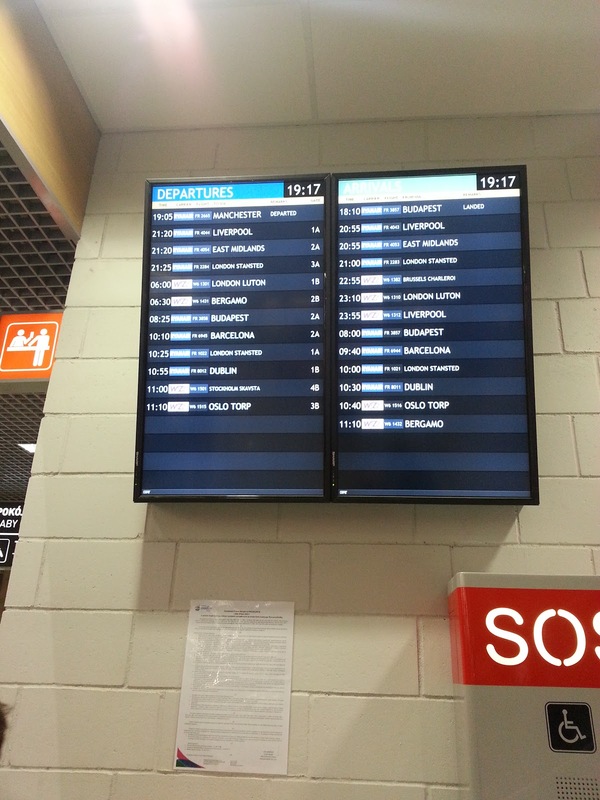 After an easy train and bus ride, I arrived back at the airport. I had a look outside to see what was visible from the road, but not much was unfortunately. Being Ryanair I'd naturally checked in online before, so I just had a look round the landside area before heading for security. From the upper floor, where there were offices and a lounge. I then passed through the passport control to the non-Schengen area. There were 3 gates, each a kind of pen with glass walls, so they could be configured to Schengen or non-Schengen as required. At this point, there were 3 departures scheduled within 5 minutes (see the FIDS) to Stansted, Liverpool and East Midlands. So it was quite a squeeze in there. After waiting around for a while, staff cordoned off half of this area and started "boarding". That is checking boarding passes and allowing people into this cordoned off point. 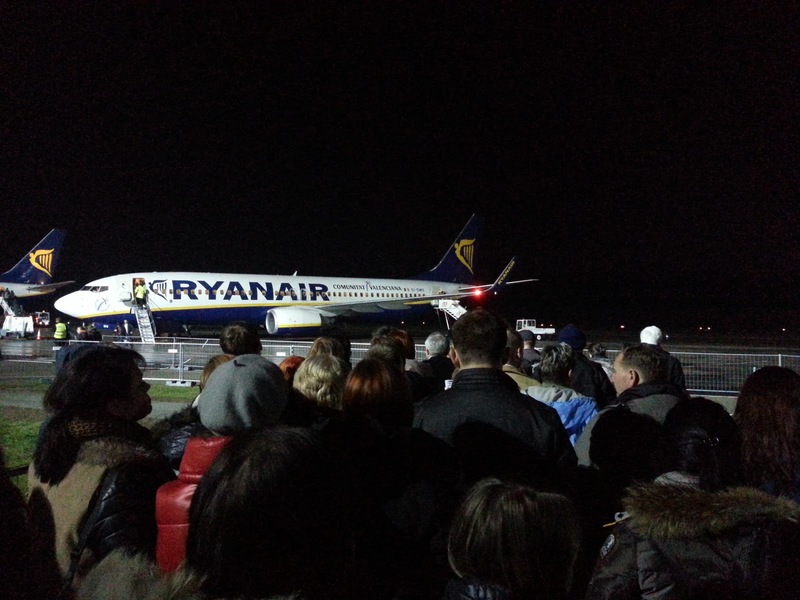 After waiting a while here, the door was opened and the scrum started - to another holding point outside by the edge of the apron. There was a small part of this pen at the front reserved for priority boarders. Despite there being "No Smoking" signs prominently displayed, at least 2 passengers lit up. Quite dangerous given how close we were to refuelling aircraft. 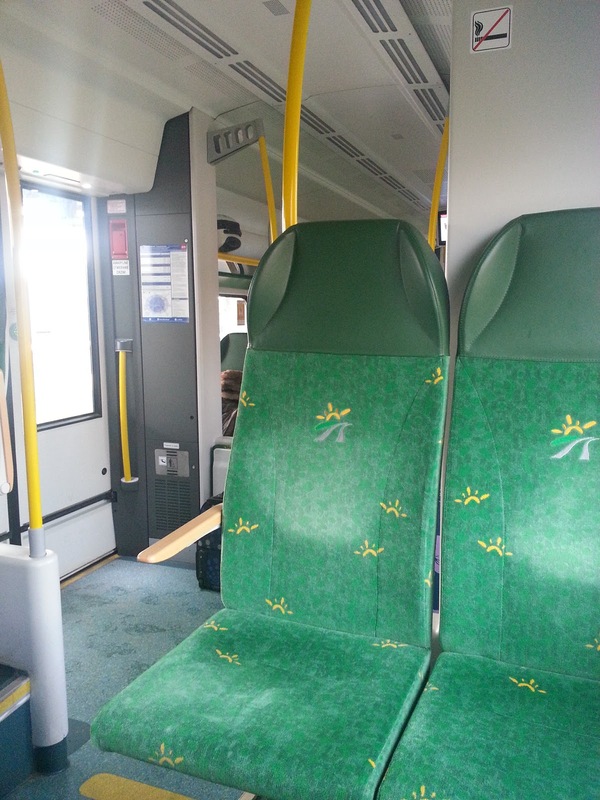 When the gates were finally opened, I headed to the rear door and managed to get a window seat near the back. 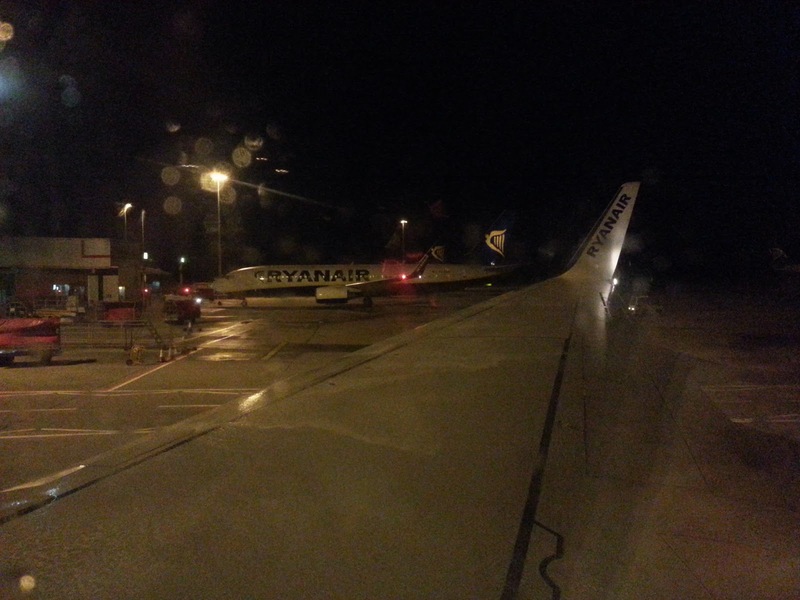 I don't actually remember much about the return flight, I must have dozed, because soon we landed at Stansted. We arrived onto a stand on the shared pier, which meant a ride on the shuttle train to the main terminal. I used the e-gate to enter the UK again, and was quickly through. I took the bus back to the car park, and drove home, after stopping at McDo by the car park entrance for a hot caffeinated drink. 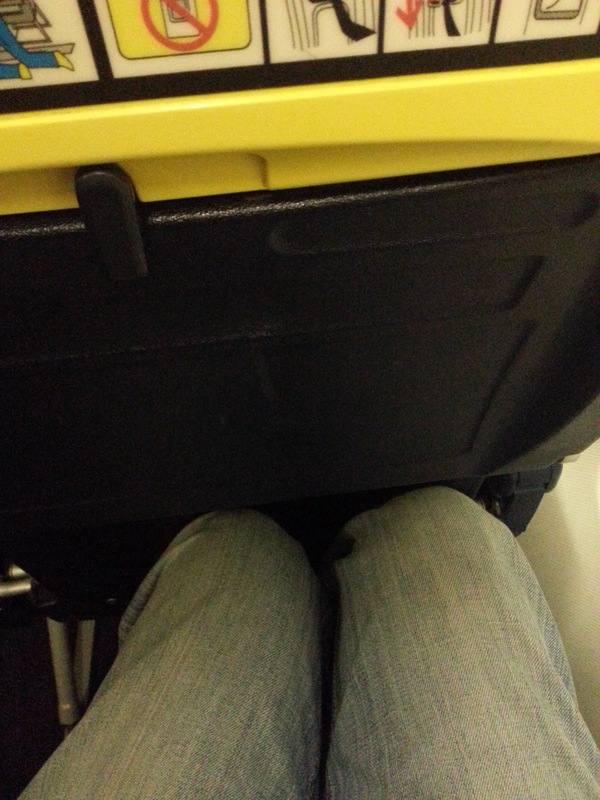 Ryanair are whatever you make of them. They can be exceedingly cheap if you play by their rules. 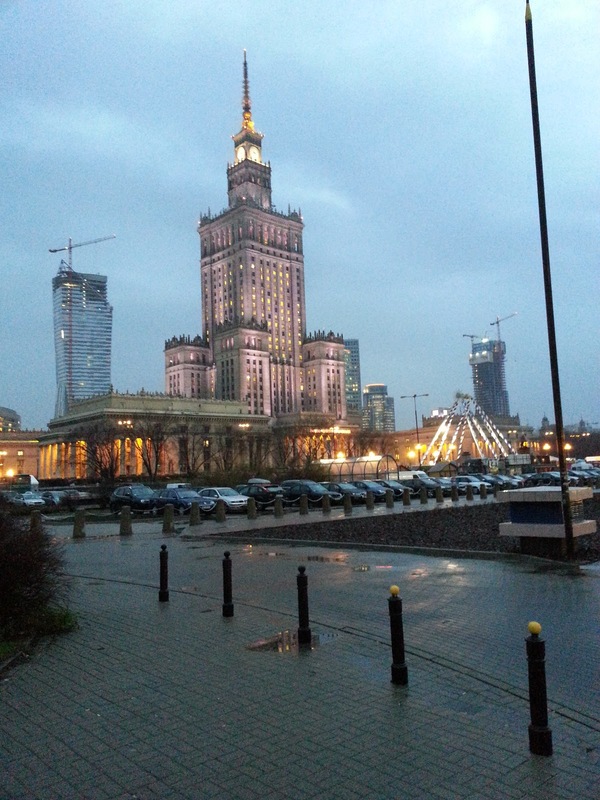 Warsaw as a destination may not have the kudos of Krakow or other cities, but was nonetheless an interesting and cheap destination. I won't be heading straight back, as there are plenty of other places I'd like to visit first, but given the opportunity I would return.